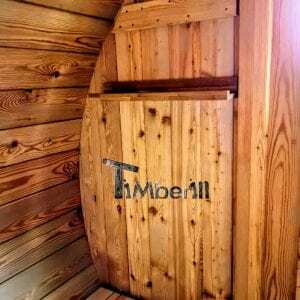 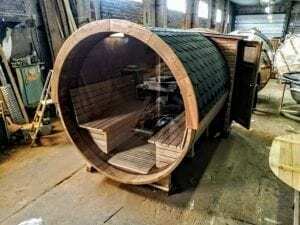 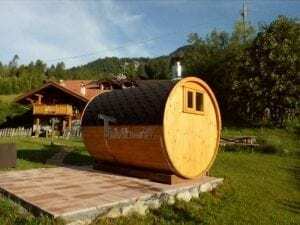 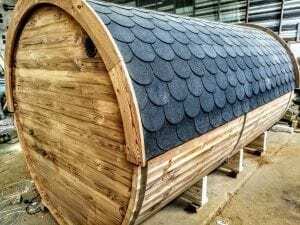 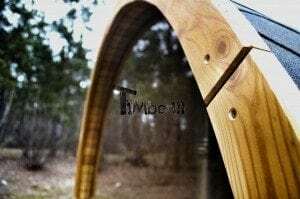 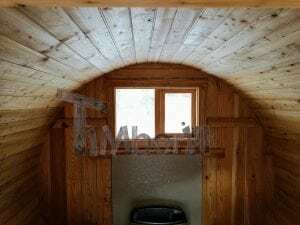 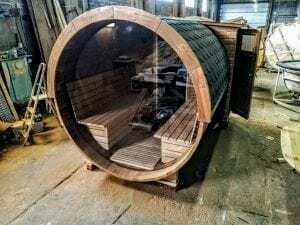 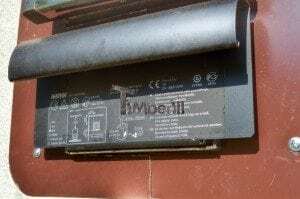 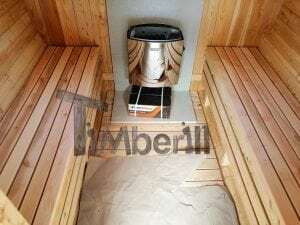 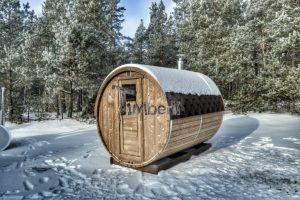 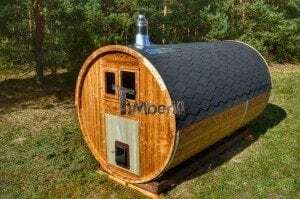 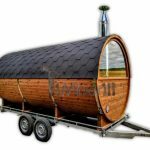 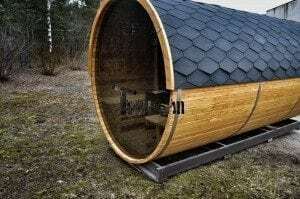 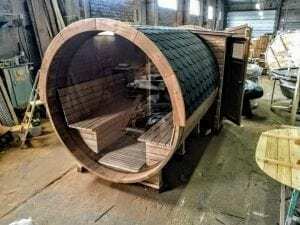 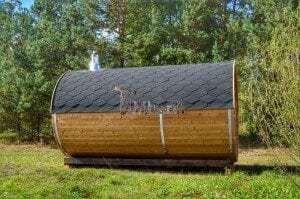 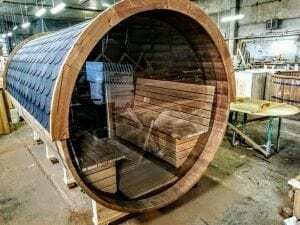 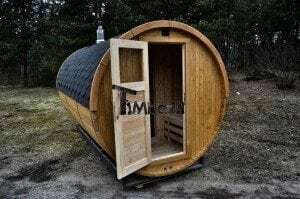 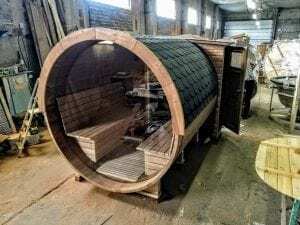 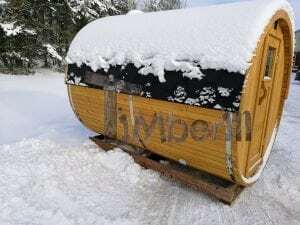 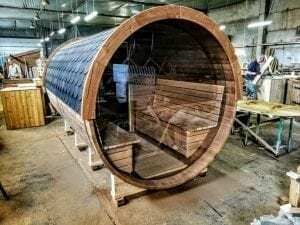 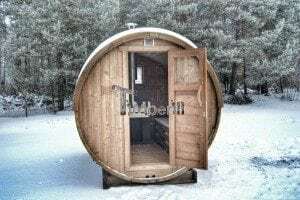 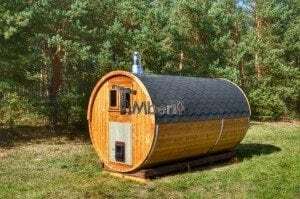 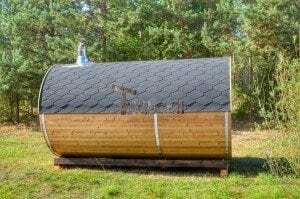 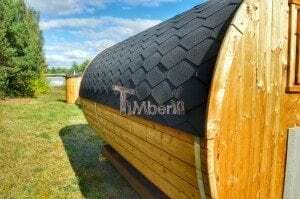 This smart design Barrel Sauna may be adjusted to your needs as every other product that we make. 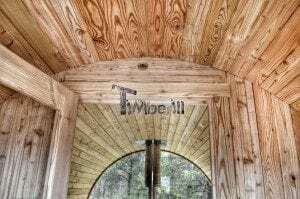 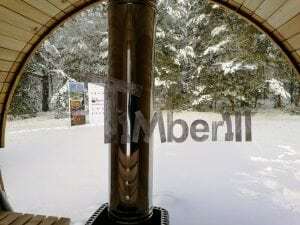 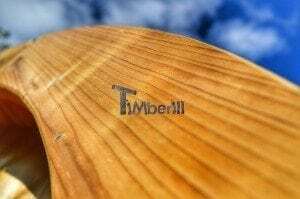 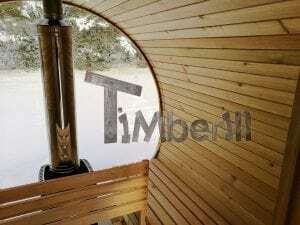 Plenty options to choose from, like wood type, heater, size and diameter, different rooms. 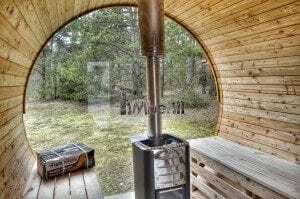 If you want to see the beautiful view outside, you may also choose half panoramic or full panoramic window. 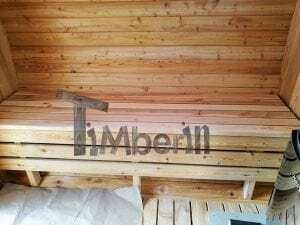 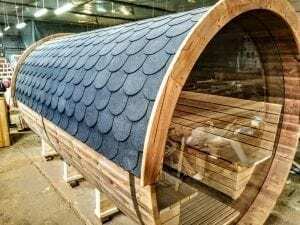 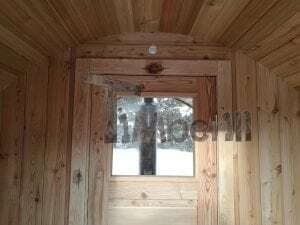 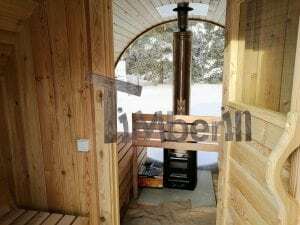 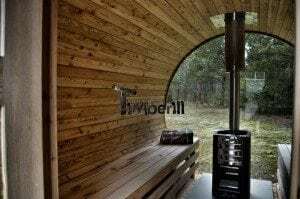 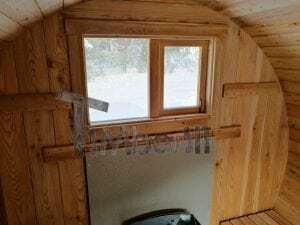 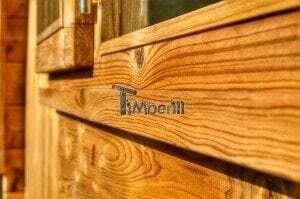 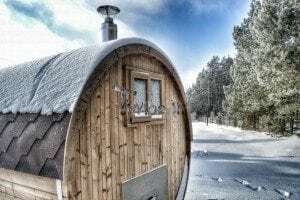 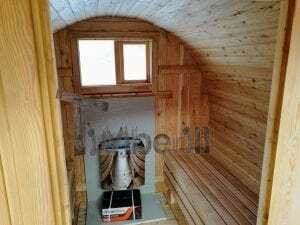 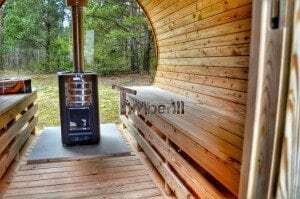 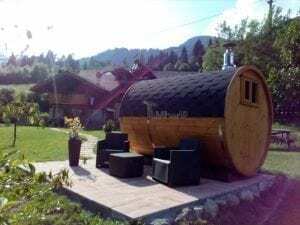 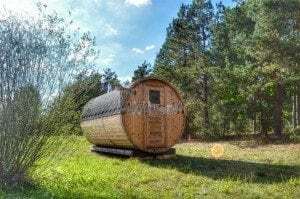 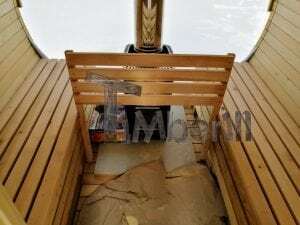 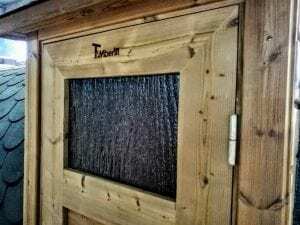 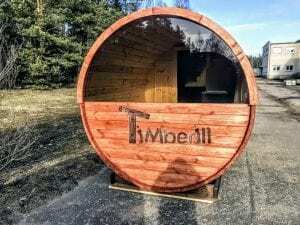 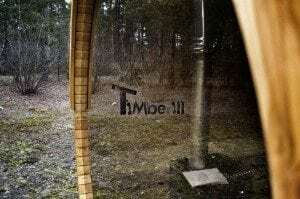 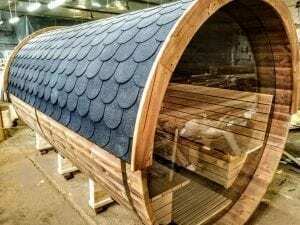 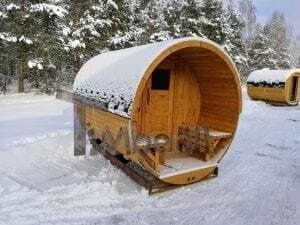 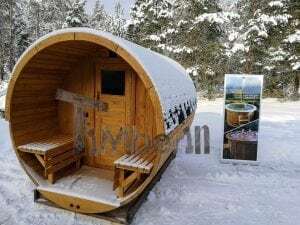 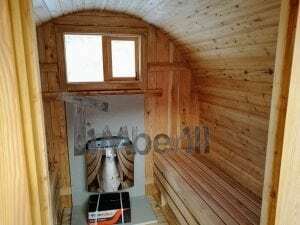 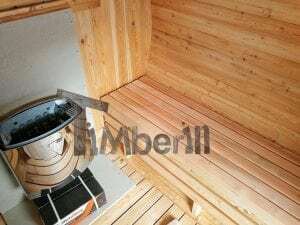 And you do not have to lose this possibility even though you can be reached only by a small transport, you may choose unassembled sauna, but still have a half panoramic window. 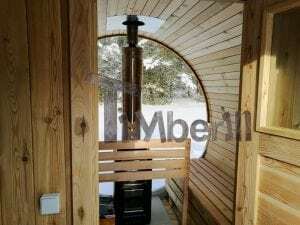 Contact us and we will offer what is best according to your wishes. 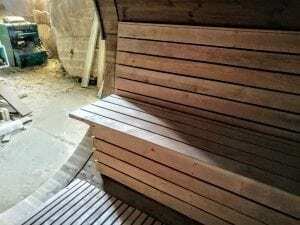 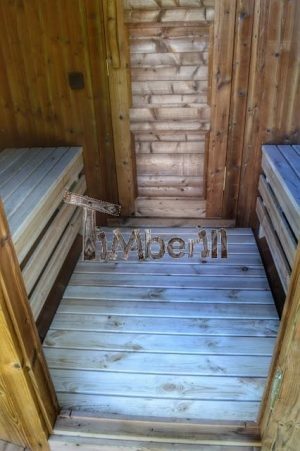 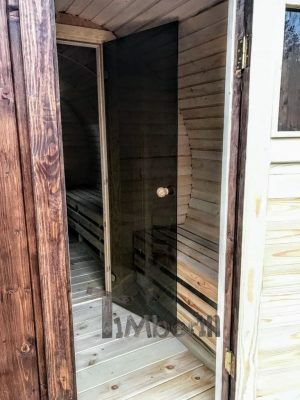 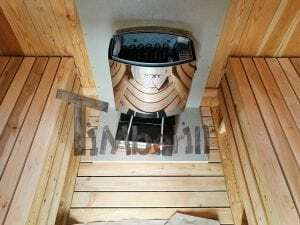 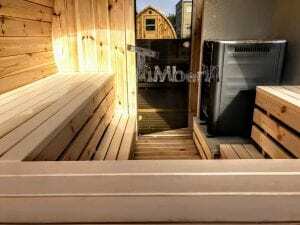 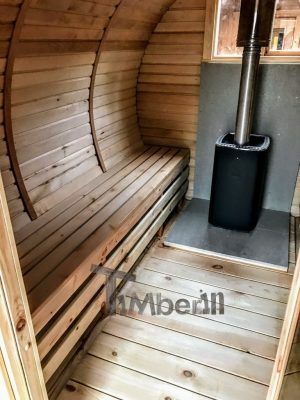 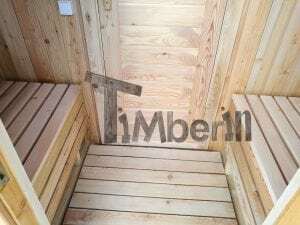 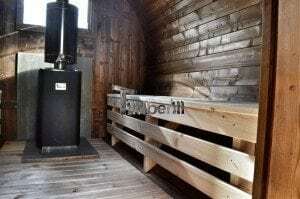 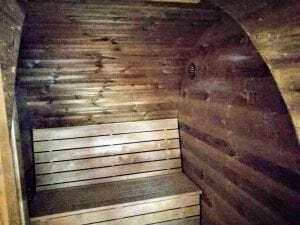 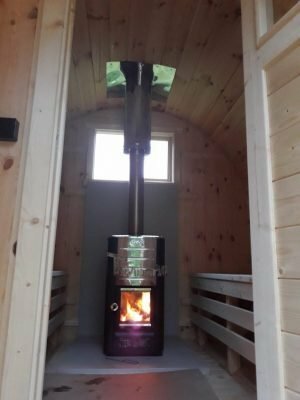 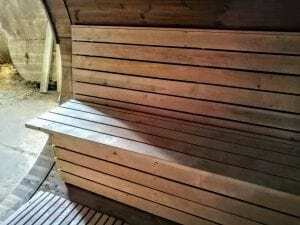 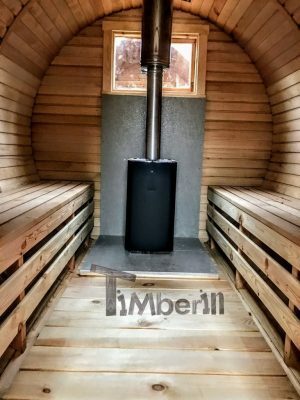 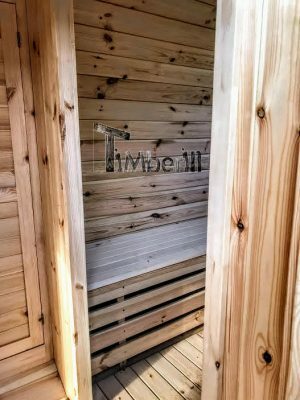 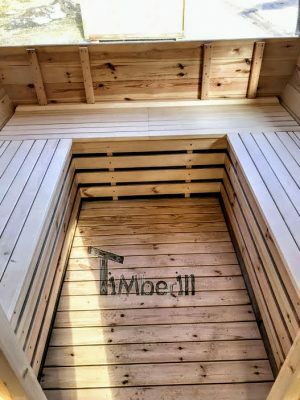 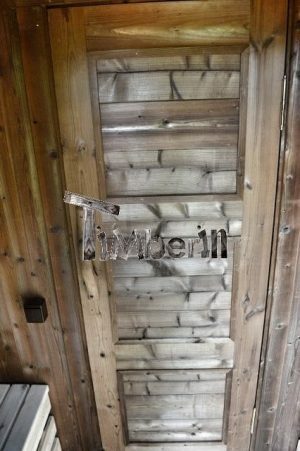 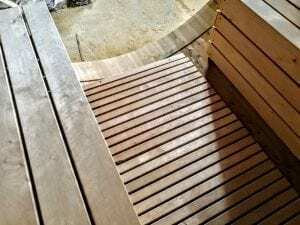 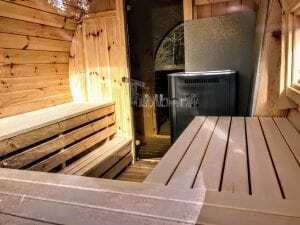 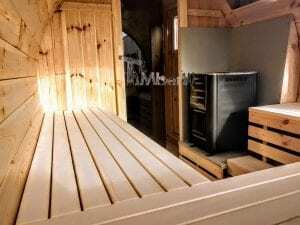 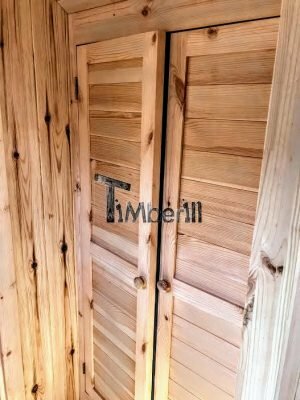 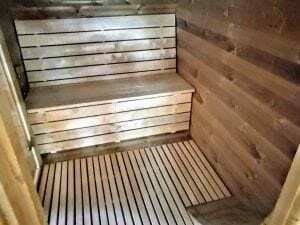 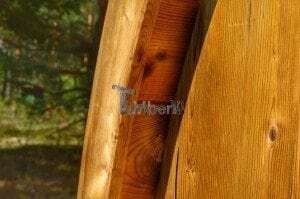 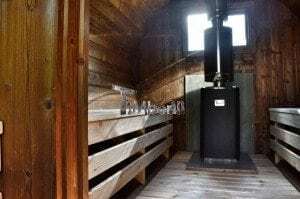 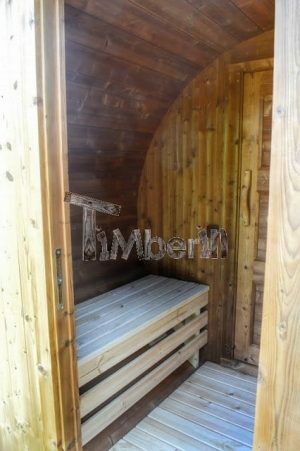 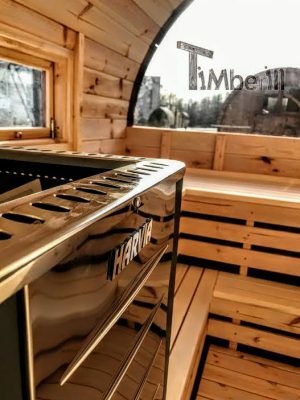 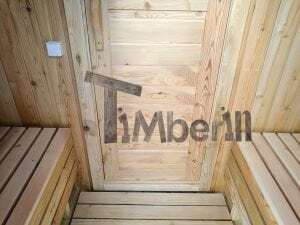 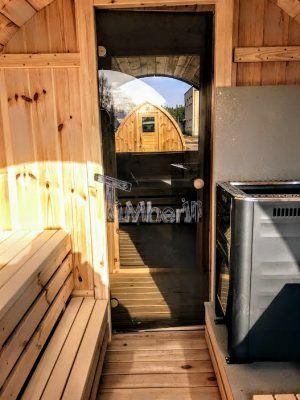 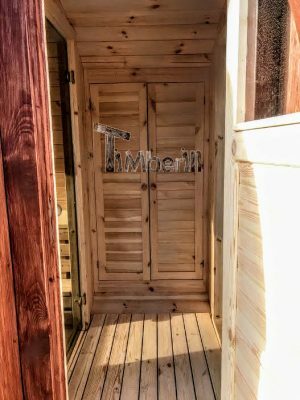 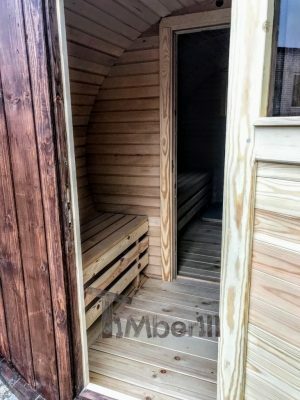 The sauna is completed and I must tell you how very pleased we are with it, it looks amazing. 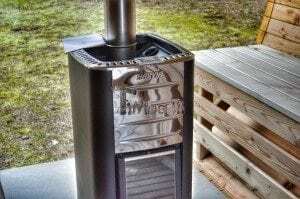 We have yet to fire up the burner but will look forward to that this weekend hopefully. 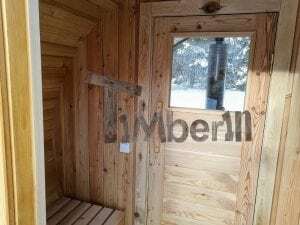 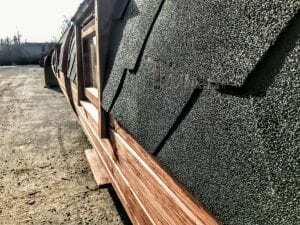 The quality of the build is superb and construction was quite straightforward. 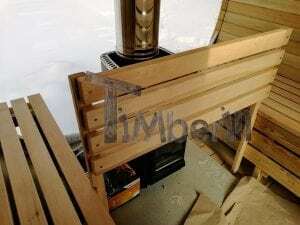 The service you provided has been outstanding, always helpful, polite and professional. 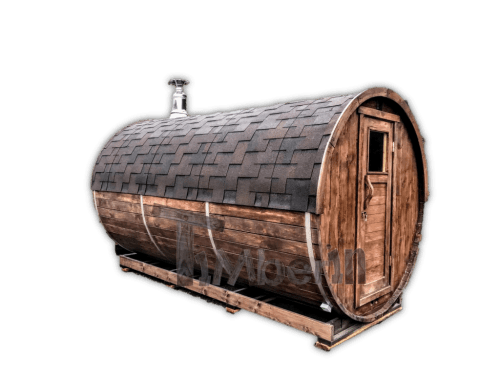 It has been a pleasure. 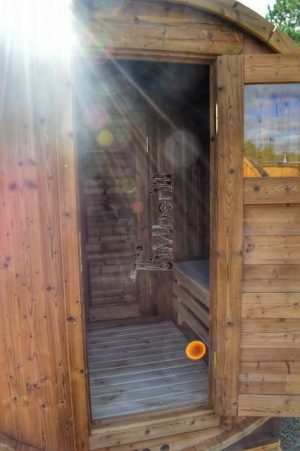 I hope this is not too many photos. 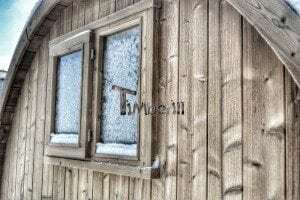 It’s such a lovely building to take photos of. 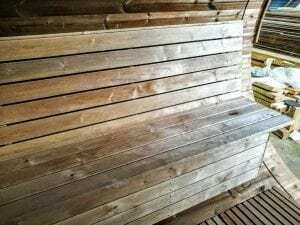 Our little dog Rio likes the look of the sauna too. 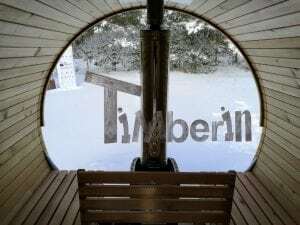 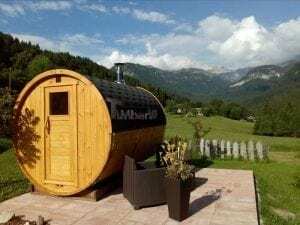 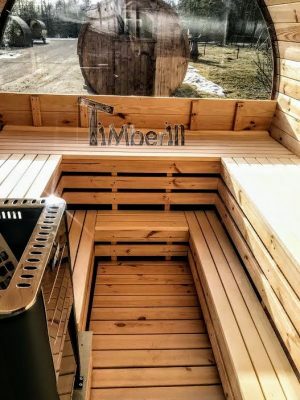 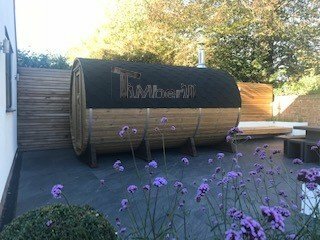 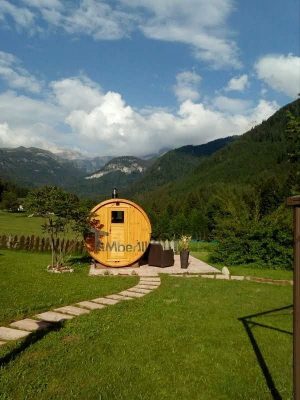 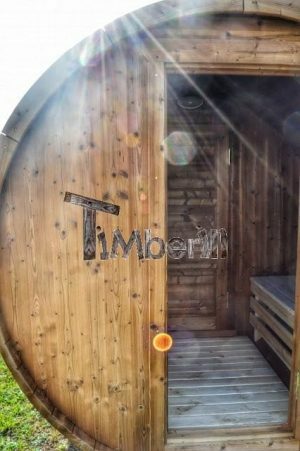 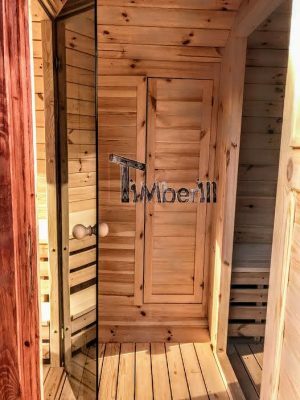 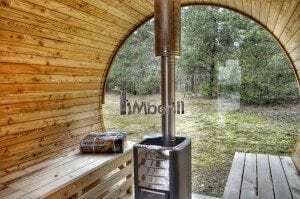 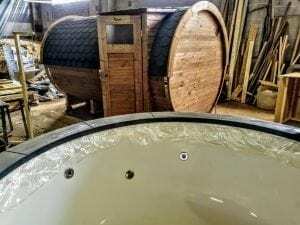 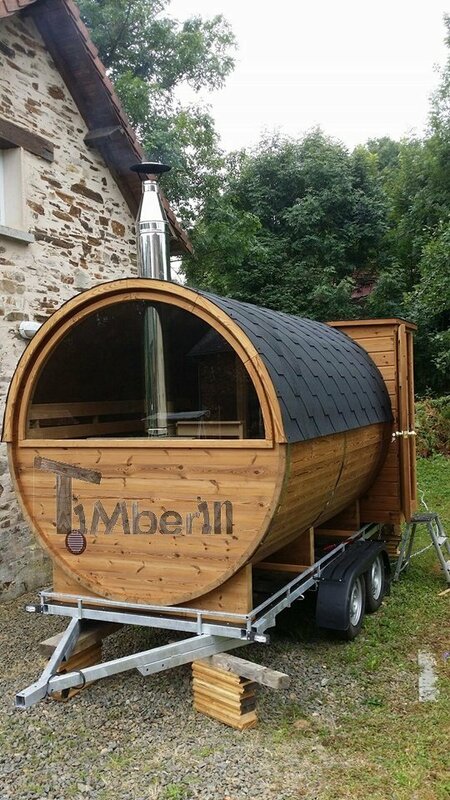 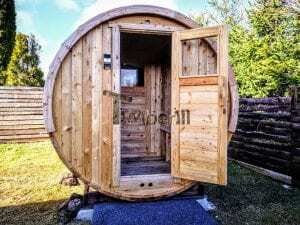 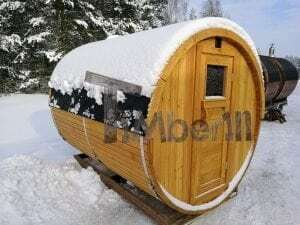 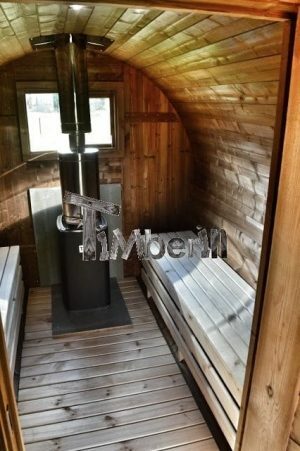 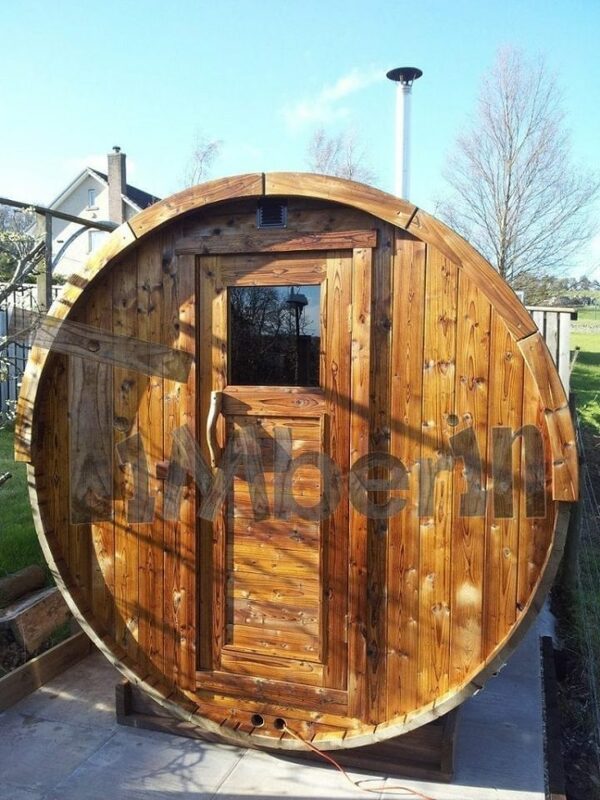 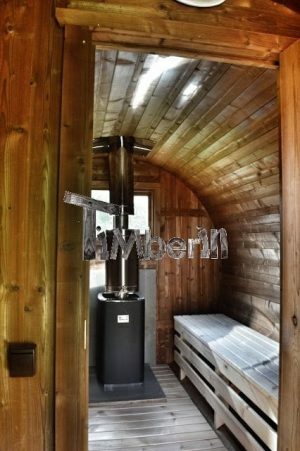 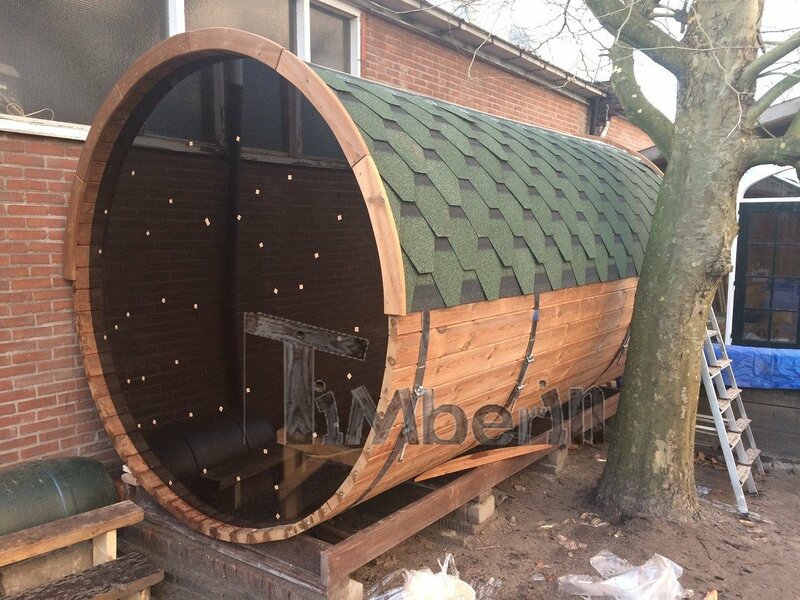 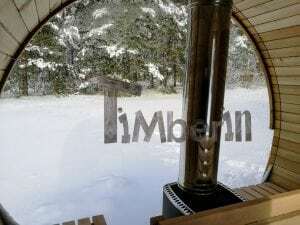 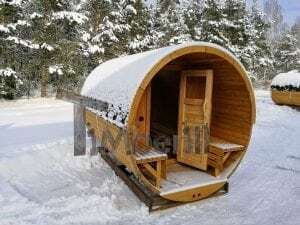 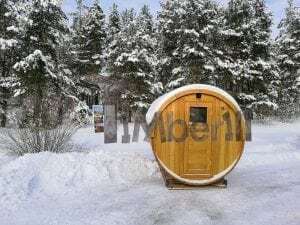 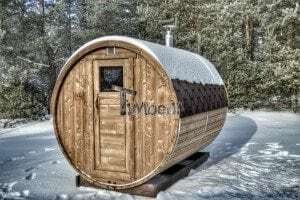 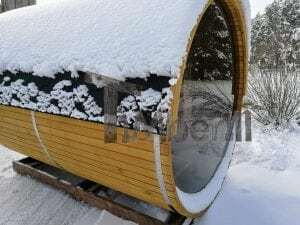 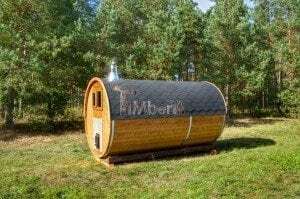 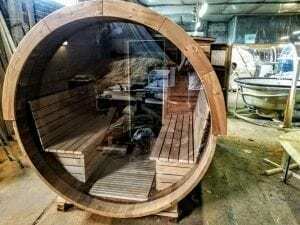 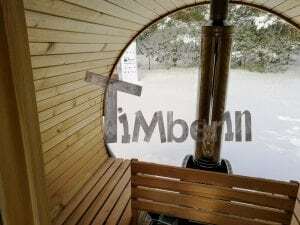 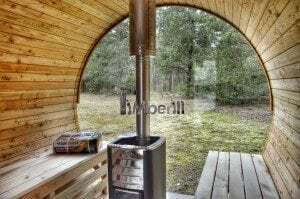 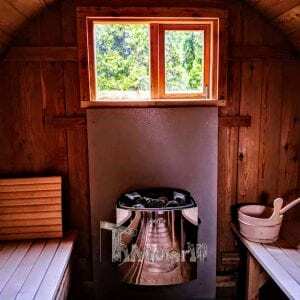 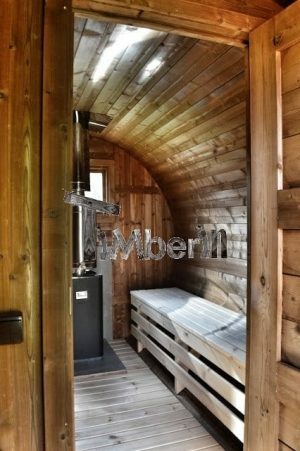 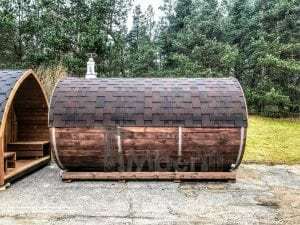 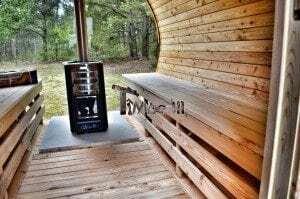 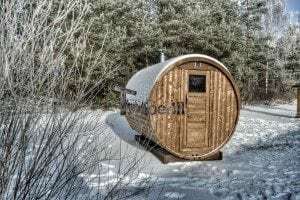 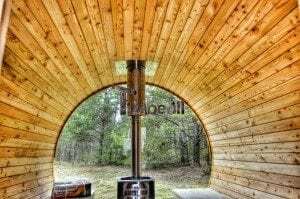 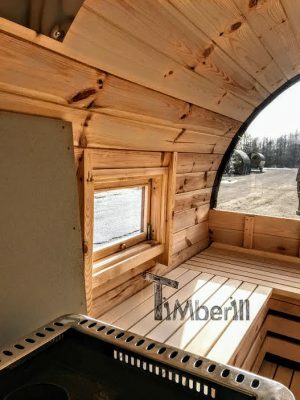 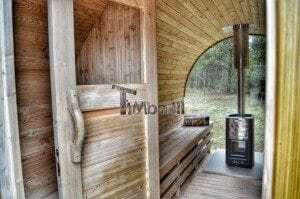 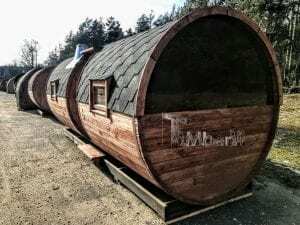 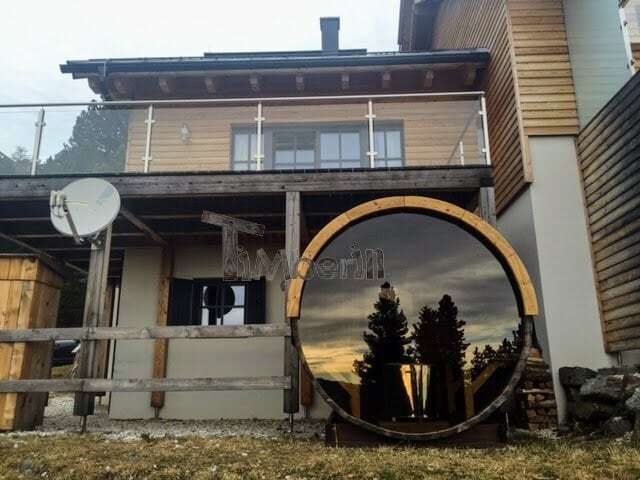 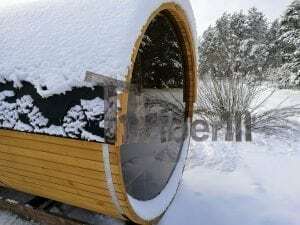 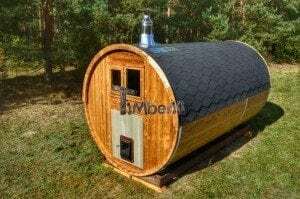 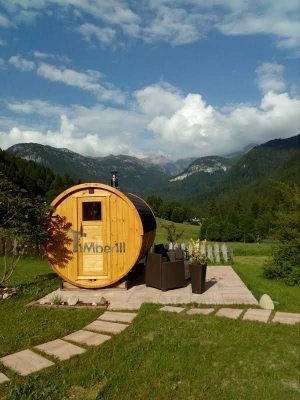 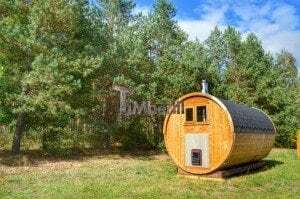 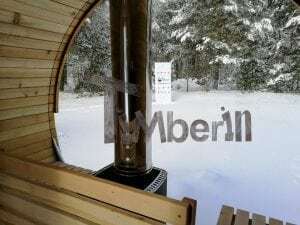 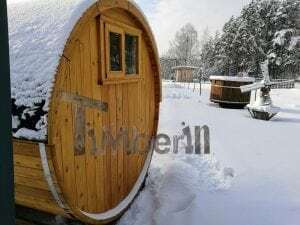 We are very pleased with our barrel sauna – the view from the glass window is amazing. 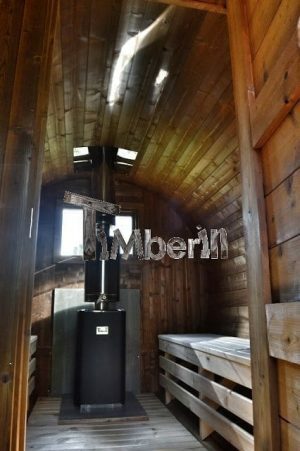 We have got the temperature up to 90 deg C so it is working nicely. 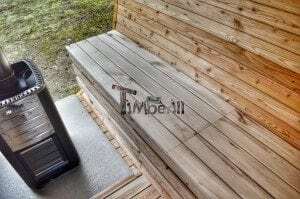 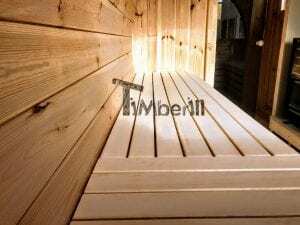 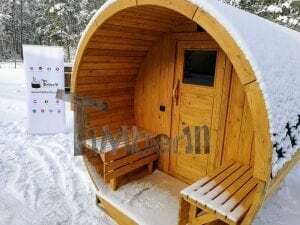 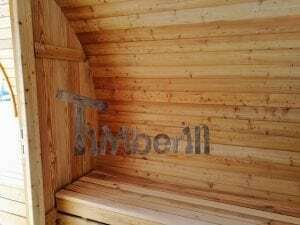 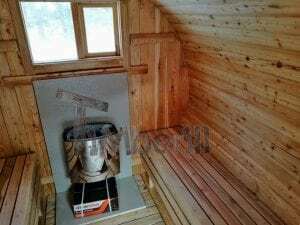 The sauna is very good quality. 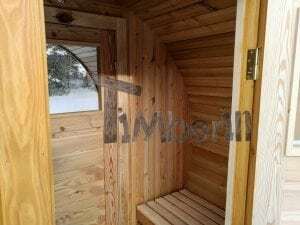 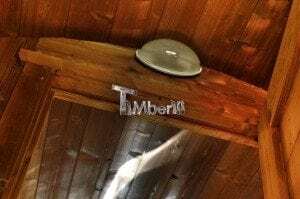 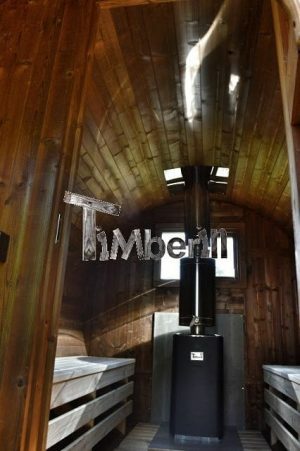 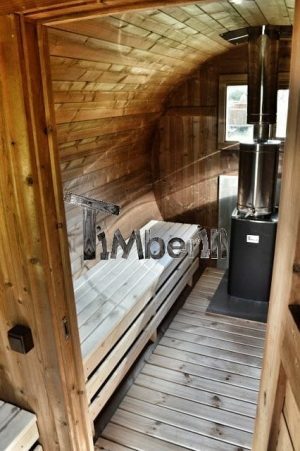 Because of the space we were building it in we had the sauna delivered unassembled and we had a local handyman assemble it. 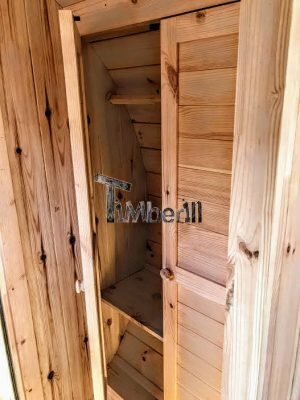 Thank you for your help and advice when required it was appreciated. 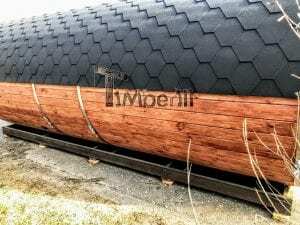 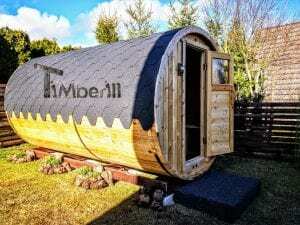 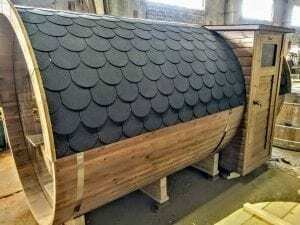 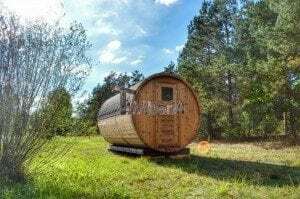 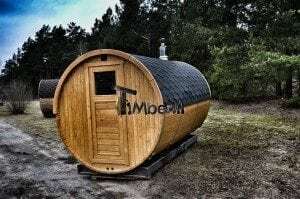 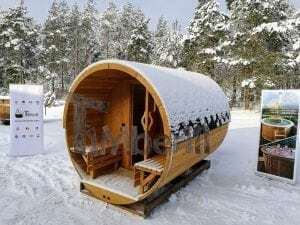 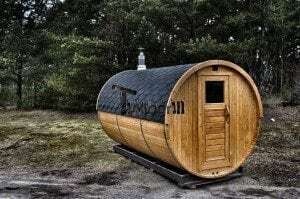 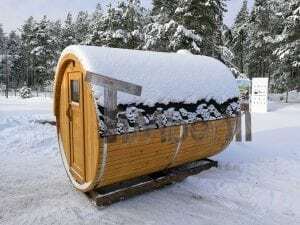 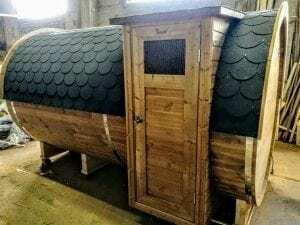 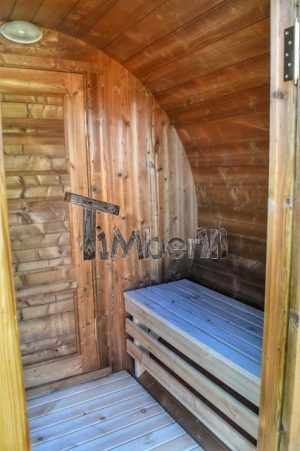 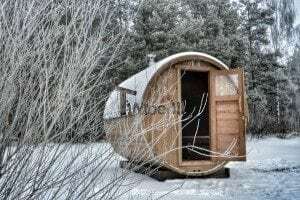 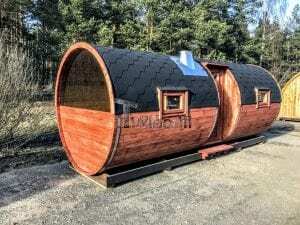 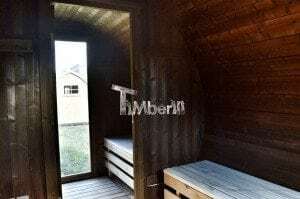 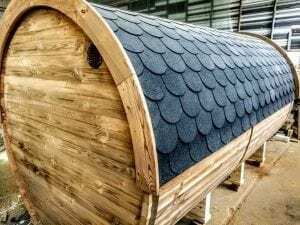 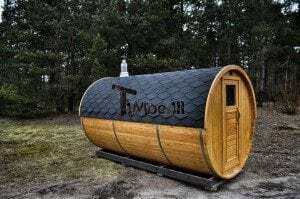 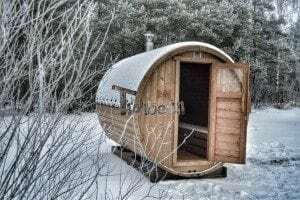 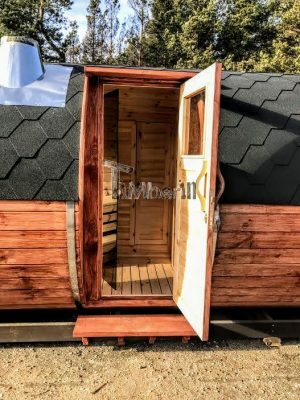 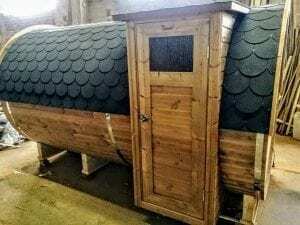 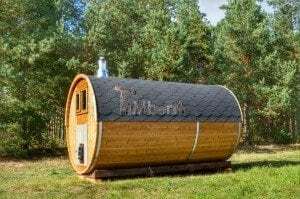 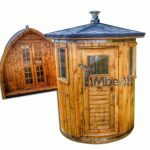 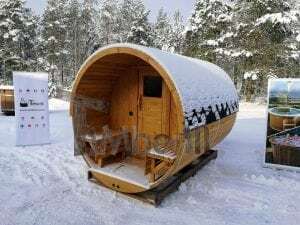 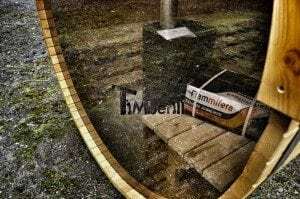 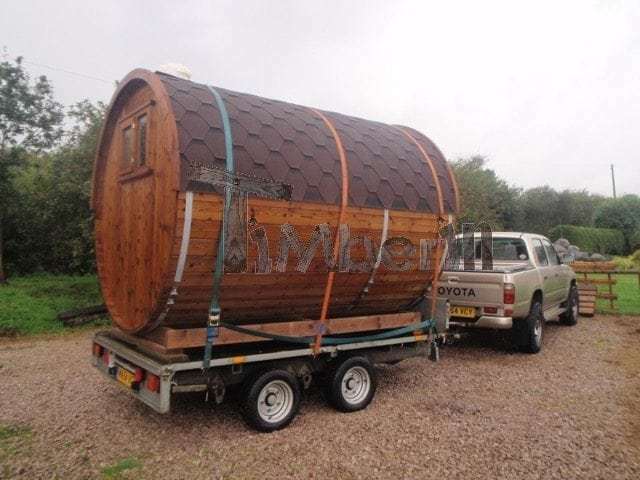 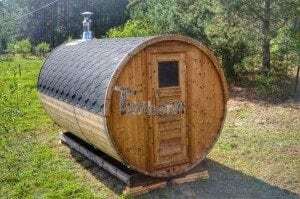 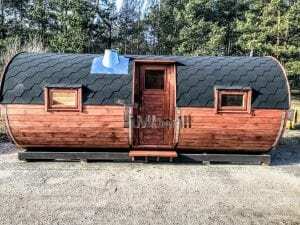 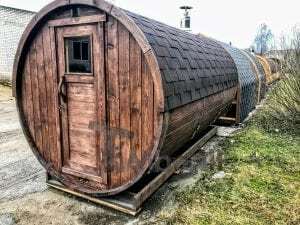 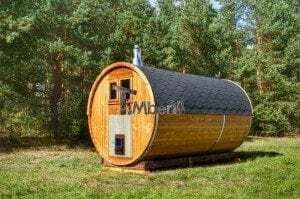 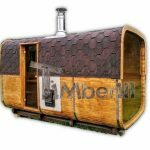 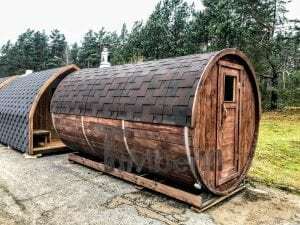 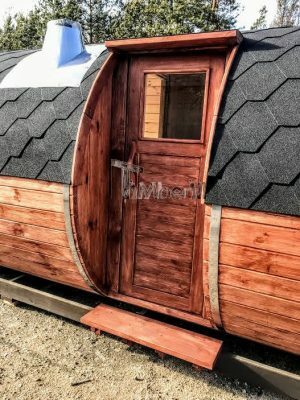 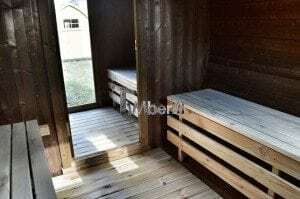 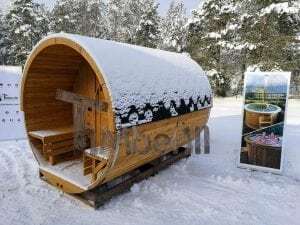 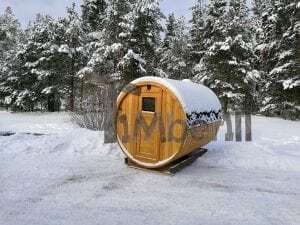 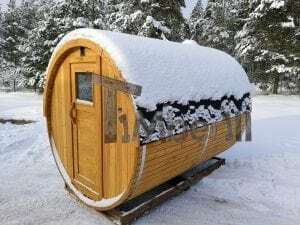 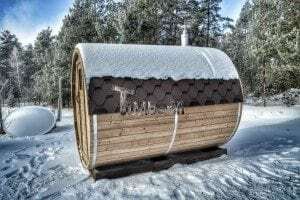 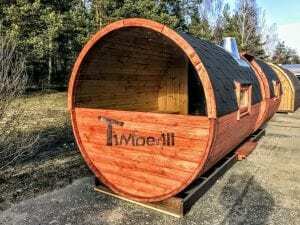 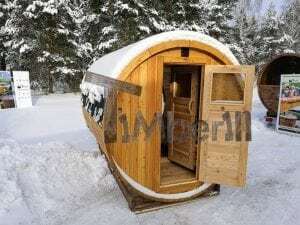 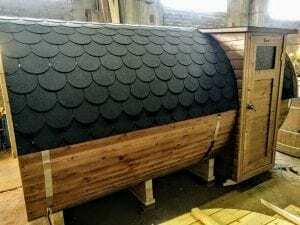 My Sauna arrived at the depot yesterday at 20.00 Hrs, the delay was mostly due to the illegal immigrants in Calais causing all trucks to be examined. 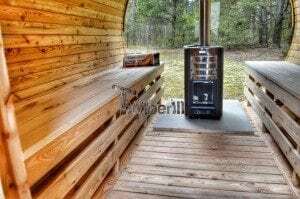 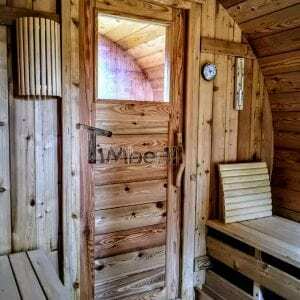 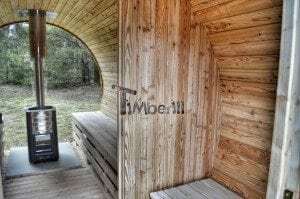 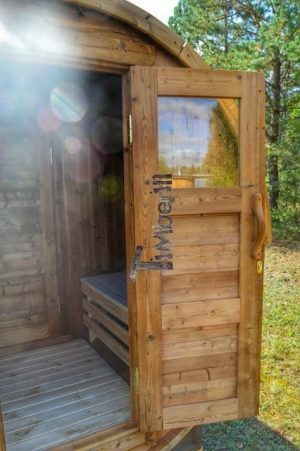 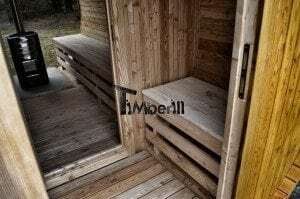 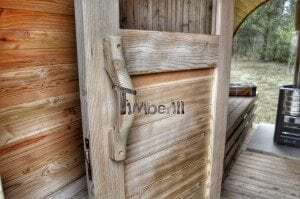 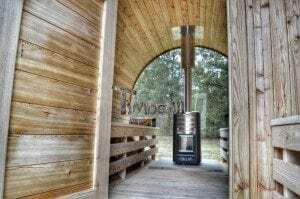 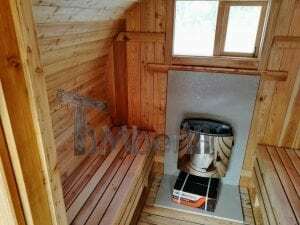 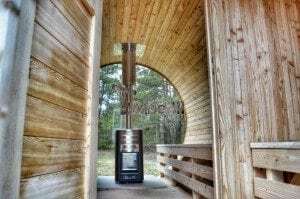 The sauna seems to be very well built, and is a very nice design with an interesting and appealing look to it. 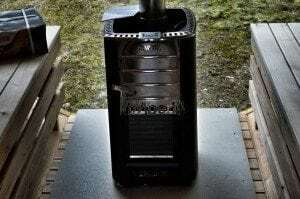 It may take a week or so to place in the spot I have for it, but I will send you pictures etc, when this is done. 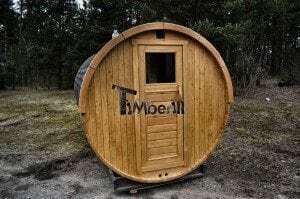 Many Thanks to your team for their good work.